A while back I helped a friend of mine grow mushrooms here in Albania. The single most costly issue was having enough spawn to get the process going. 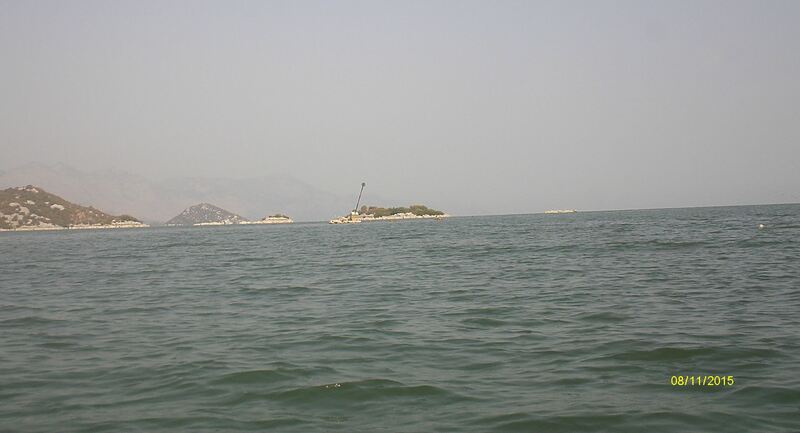 Shipping to Albania is very expensive and many will not ship here. I found a place to ship small quantities to me and we made do. At the early stage it really didn’t matter, we had enough at 180 grams. The top pictures are the first habitat that we tried and while we grew mushrooms it was small, and didn’t allow for enough light for our species to grow to their full potential. At this stage we recorded our moisture both in the substrate and the air everyday. We learned a lot. My partner in crime Nik decided that we should convert his wood shed. So we did. We covered the walls with insulation and plastic on the inside. Made the top portion of the Southeast wall clear to allow enough light in. We had large bushes diffusing any direct light before it hit our windows so it worked out perfectly. We used blankets soaked in water as a humidity control, but soon found that with the concrete floor after getting the humidity up to about 90% we only needed to wet the floor every other day to maintain at least 85%. It worked out perfectly. Unfortunately Nik discovered that this business would take too much time away from his primary business of his restaurant. So after having success with growing our second batch of test mushrooms he decided that he could not pursue this further. I agreed to carry on the experiment in the hopes that someone else would be interested in taking our lessons learned and my new batch of locally cultivated spores that were becoming spawn to the next level. Commercial production of mushrooms in Albania. I was successful growing a third batch of mushrooms from the spawn I produced. I also experimented with Shitake, Lions Head, Wine and King Mushrooms. I was successful with those except for the Shitake, though my yield of the wine mushrooms was not great, but I am sure I could have improved it over time. I offered our experiments and lessons to three people here and while everyone was hot to trot to start, once they realized farming mushrooms isn’t quite as easy as they think they backed out. Now to be honest one just couldn’t find a space to make it happen and was probably the best choice of the three, but he was space poor. I told him if he is ever interested again I would help him get it started. Phase one: Grow Oyster Mushrooms consistently in a straw substrate. Accomplished. Phase two: Cultivate and collect spores to reproduce in commercial quantities. Accomplished. Phase four: Expand other Mushroom experiments for commercial runs. Not accomplished. It was a great experiment for me as I didn’t know anything about growing mushrooms and still have tons to learn. The entire experiment lasted from September 2015 to April of 2016. I did cultivate, inoculate, spawn and grow oyster mushrooms from spores. I was very happy with the results. It can be done inexpensively in Albania. It would have created at least 5 jobs and a whole new industry of recycling the waste stream for either compost or animal feed. So Albania has to rely on imported mushrooms until some other Albanian entrepreneur takes it up. We learned a lot and had few laughs along the way. Now for what has been going on in my shop — I personally haven’t done much, a small candle holder with a Lilly and Cattail for my wife’s Aunt’s 80th birthday. She has asked many times when I was going to make her something and so I got hot. My apprentice FJ on the other hand has been busy making all kinds of stuff. Candle holders, bottle openers, torches and a sign for a friend of his that has a cafe. Here’s a few photos of his stuff. I walk by the sign all the time and forget to take a picture of it. We didn’t paint it or install it, but it looks really good. I will try to remember to take a picture of it for next time. 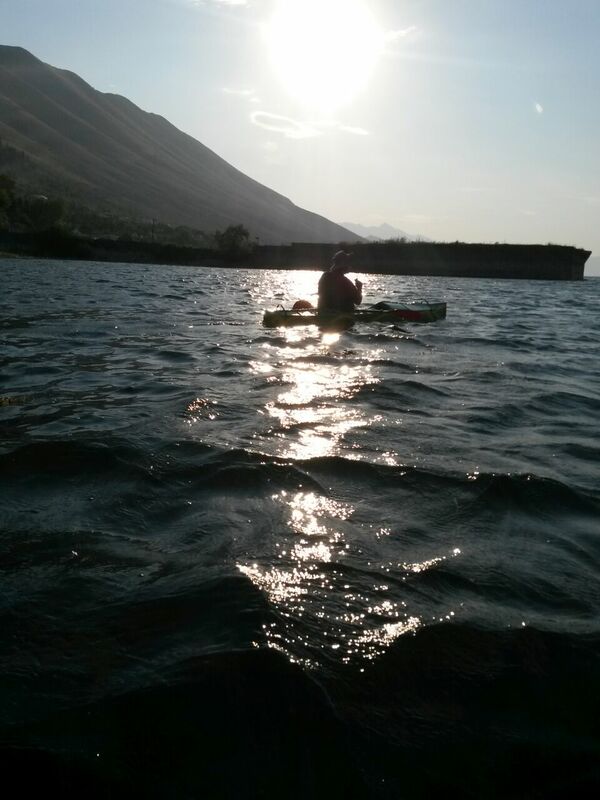 I continue to kayak Lake Shkoder and will make it down Buna River to the Adriatic this season. That’s that plan anyway. See ya at the Forge!!!! A lot of heat coming off this. I put that hole in this! All bronzed up and ready to go! So close. Head seated on my handle! Then my wife asked me to make a candle holder for a couple of friends. I decided to make a Dogwood branch and use a wooden base. I did’t have a piece of steel wide enough to mount it to and have candle pots. Wood is good! The flowers are riveted on to the stems, but, dare I say it, I can hear the shoe dropping already, welded them to the branch.  I still have heat problems and will get around to addressing them after the new year. 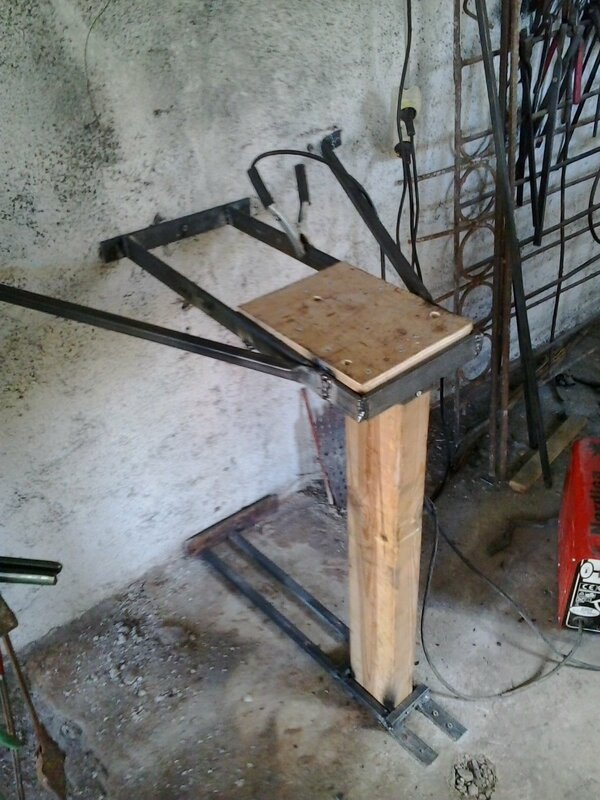 The students want to see real forge welding so I am forced to finally do something about it. I decided to just use a nail for the candle stem. The wood is a piece of Chestnut somewhere between 150 to 350 years old. I am not sure which section of the house this came from. I have to get candles tomorrow. I am almost done, I still have one more if I can get it done tomorrow, Christmas Eve. I will post a few photos of the hammer my students made when FJ finishes his handle. Until then…. 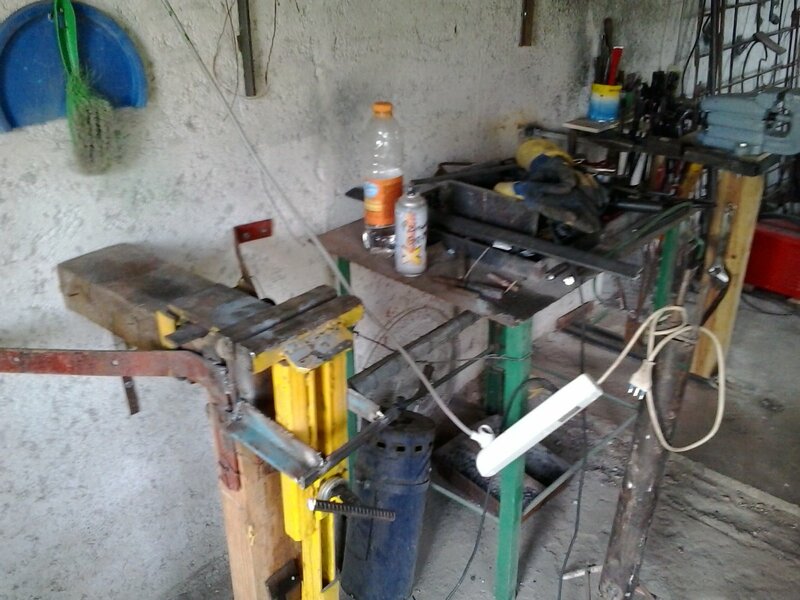 I have been busy in my shop giving a couple of Peace Corps volunteers here some lessons over the last few weeks. They have been doing very well. Ezra and FJ are of course more interested in actually making stuff and my shop isn’t ideal for training two at the same time, but we are making due. We are all having a good time. So much so that Ezra brought his friend Alisa to check out the action today. She didn’t understand what all the hubbub was as she made a candle stick in 15 minutes just like the youtube videos show. Hahaha. Below I posted a few photos from the past few weeks starting with today working back. The new vise has a open frame that allows me to hang my tongs and hammers. It is close enough to use with both the gas and charcoal forge. The anvil can be moved to make it easier to work depending on what I am doing. 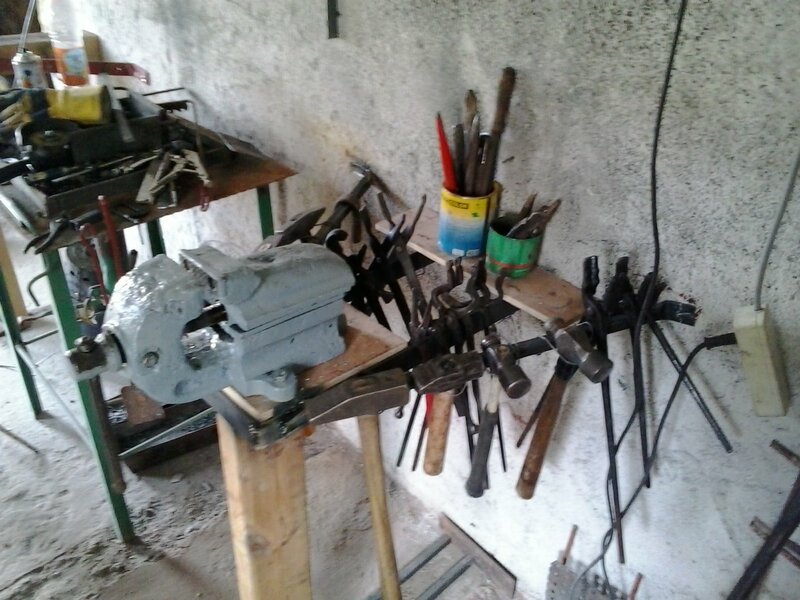 Old vise new location, one vise on each side of forge now. So the shop is still evolving. My next project is well underway and is another chess set. Smaller and I think less complicated than the last one, but we will see, sometimes those simple designs are more difficult than you think. So the shop is still evolving, for now…. The Lake Trials were a success, there were no leaks!!! Yeah!!! 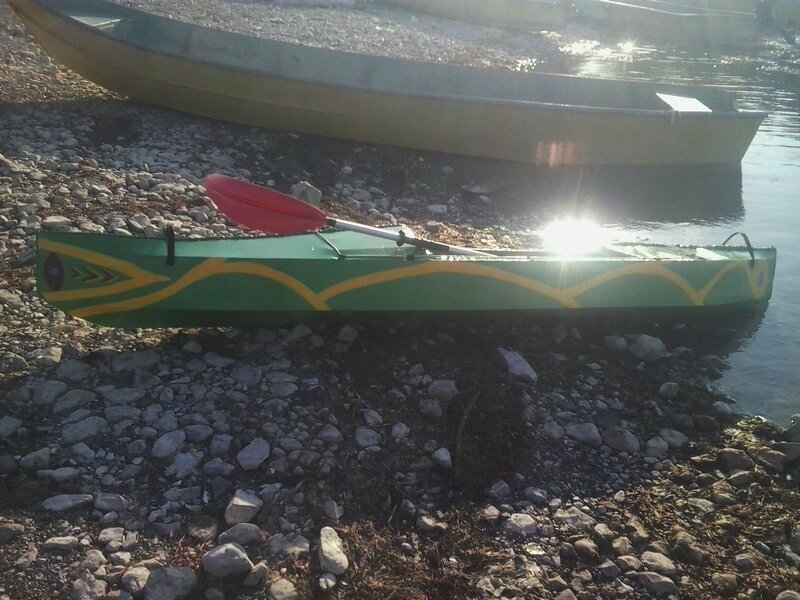 I have a Kayak! My friend Evis called and wanted to go out Saturday August 8th. He also had a new to him kayak that he wanted to try out. The sky was clear and the temperature was about 92 F or 33 C, but there was a heavy breeze blowing, about 7 mph with gusts to 9. I think it worked out perfectly as it gave me a feel for how she rides. She drafts about an 1 inch more in the rear than I planned, but it doesn’t seem to effect me much. The bow rides spot on. Mine and Evis’s kayaks getting ready to go. I discovered that the foot rest wasn’t going to work as installed, my back needs some sort of pad and I now see how tight it is in this kayak. I have to admit that the painted canvas here is going to be a lot of maintenance. There is nothing but rocks on the shores, in the water and at the beaches, so the skin will be getting scrapped regularly. BUT it is so light! I will have to let you know in a couple of months or next year maybe just how much maintenance it is. I am not happy with the adhesion with this paint at all and will definitely use something else. Oh well, next time. I fixed the footrest. I added a second adjusting or release cord and made it wider. It worked and felt really good today. I had a 3 hour run today from Shiroke to the Montenegrin border. 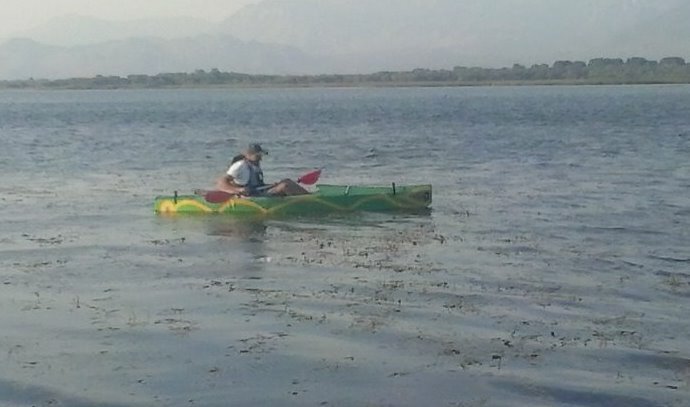 It took me about 1 hour 10 minutes to the border, about 6.3 km and that is a reduction of almost 30 minutes in Beastie my 1st kayak. There was enough wind to create a nice rolling wave action with a head wind of about 6-7 mph today on the way to the Montenegrin border. I got to see the bow have water wash over it and see that it sheds the water just like I thought it would. I didn’t get any further than where the handle is located at about 12” off the tip. Lighter and faster! Of course there is something to say about all the room of Beastie, it was like riding in a Caddy. Hahaha. 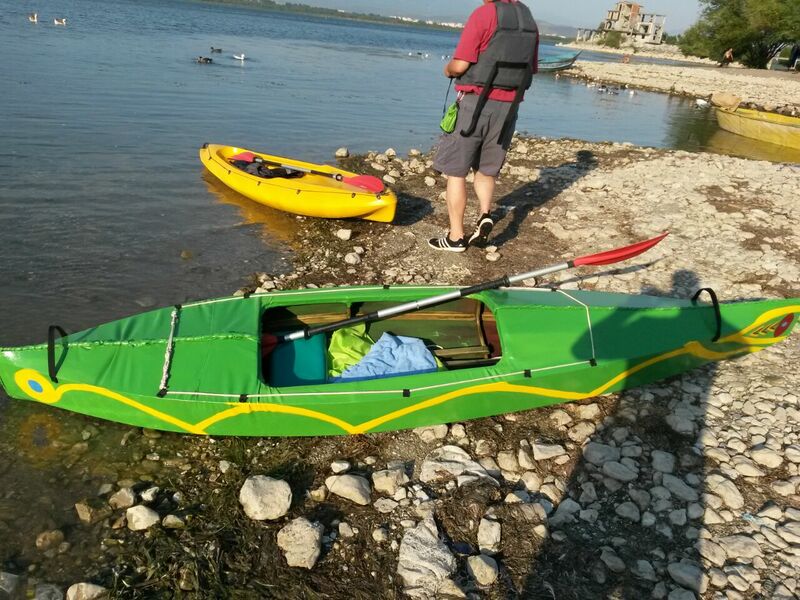 So all in all I am very happy with my new kayak! Thanks to everyone who helped me, there were a lot of you.